February 20, 2009 | SALT LAKE CITY -- Andrei Kirilenko was back on the court Wednesday night against the Memphis Grizzlies, less than three weeks after having surgery on his right ankle to remove bone fragments. 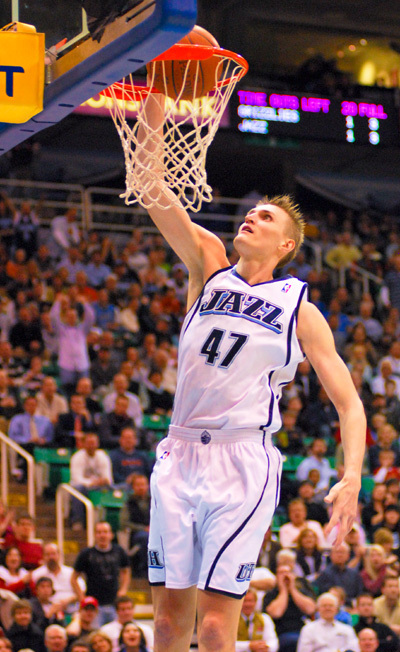 Returning a couple of weeks sooner than predicted, Kirilenko gave the Jazz 14 points and 3 steals in 17 minutes of play. "I'm so tired," Kirilenko said. Having only expected to play six or seven minutes, Kirilenko said he was winded but expected to be back in game shape within a week. "I wanted to try and spread Andrei's minutes out," said Jazz Head Coach Jerry Sloan. "There's no pain at all," Kirilenko said. "We don't want to jinx it, as long as it feels good, no soreness, no pain, I'm going to keep playing." Jazz point guard Deron Williams said, "He [Kirilenko] looked great yesterday in practice, he looked like he hadn't missed any time at all… his energetic self as usual." "Today is a triple joy," said Kirilenko, "getting back from my injury, have a birthday, and win the game." Although the Jazz beat the Memphis Grizzlies 117-99, the team wasn't entirely satisfied with the win. Williams, who had a double-double, said he was "a little shaky out there." Sloan said, "We were out there one stretch, it looked like we had boxing gloves on our hands. The ball was going everywhere, we couldn' catch the ball, ball went off our heads." Kirilenko, who was hit in the face by an errant pass, remained positive on the eve of his 28th birthday, grinning as he said, "It's nice to come back with a victory."